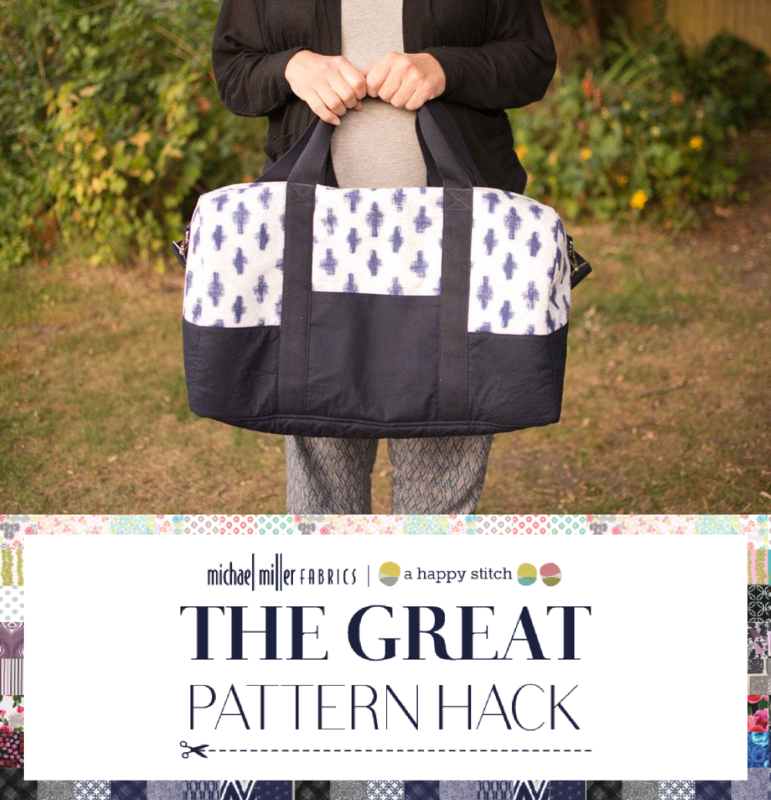 I’m very happy to be joining The Great Pattern Hack today*. 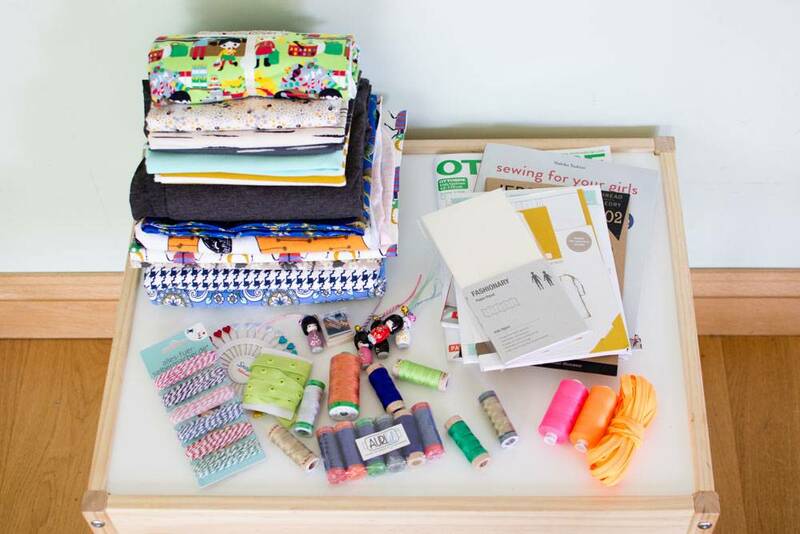 This event is co-hosted by Michael Miller fabrics and Melissa from A Happy Stitch and is a two week celebration of bloggers, fabric, pattern designers and creativity that runs from June 29th to July 16th. 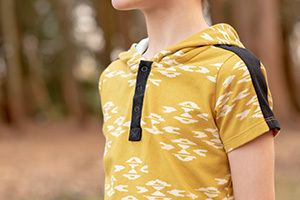 Each day of the blog hop, a blogger will “hack” a pattern, using awesome patterns and brand new Michael Miller fabrics. 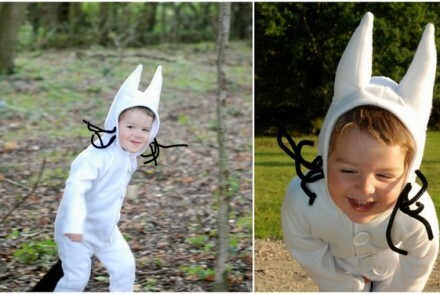 Each blogger is using an existing pattern but making it their very own. This seemed like such a fun project to get involved in. 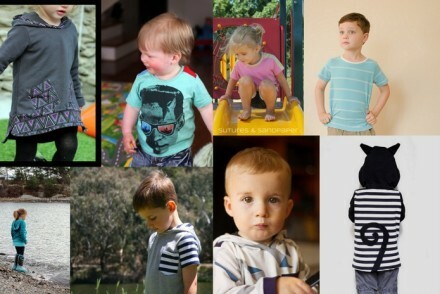 Often when I come to make a pattern I can’t help but think of ideas to customise it. That is one of the best things about sewing – being able to choose every single detail and having control over the finished item. The variations you make can be as simple or as complicated as you like, it all contributes to having a one of a kind piece. 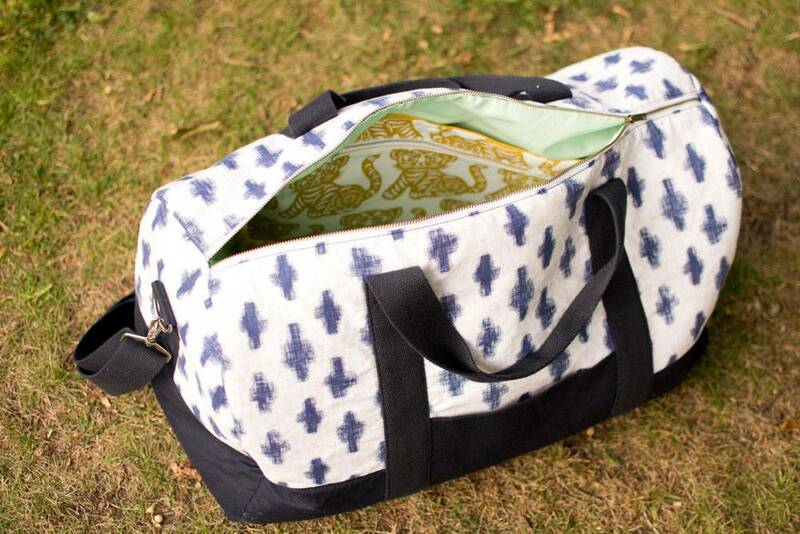 I chose to make the Portside Duffle Bag by Grainline, which is part of the Portside Travel Set. 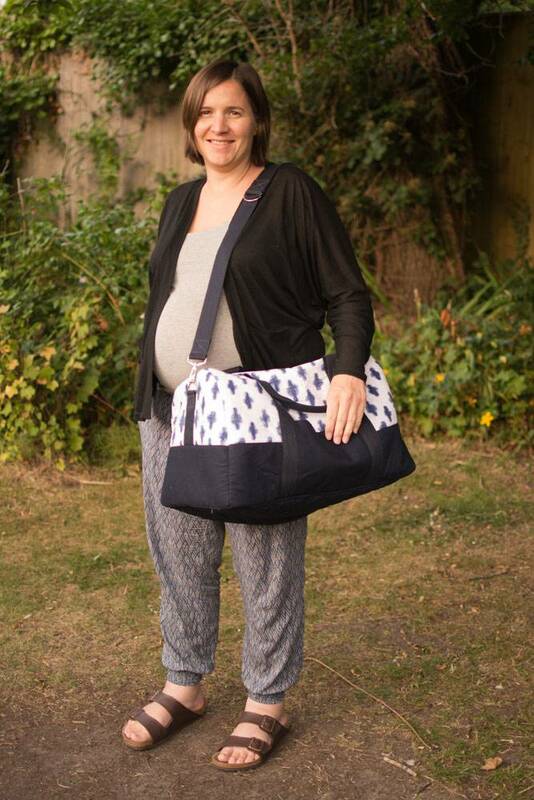 I’ve wanted to make myself a bag for a while now and, with my due date fast approaching, a large duffle seemed like the perfect option for a hospital bag. 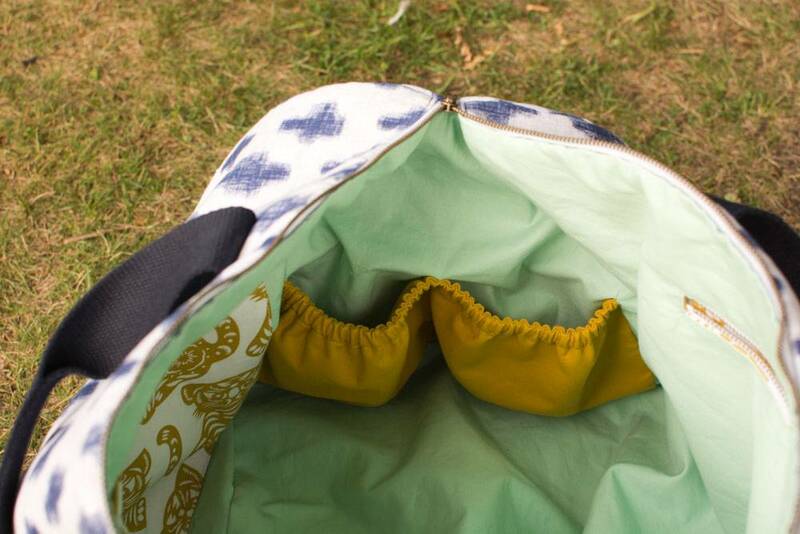 I knew immediately that my hack would be to add several interior pockets so I can try and keep my stuff organised. 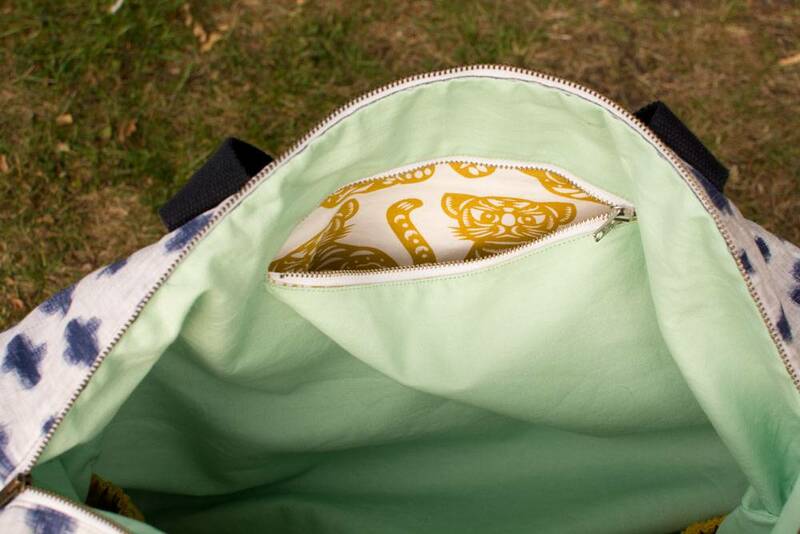 Unfortunately, it turns out that interior pockets are not that easy to photograph. In case you can’t tell the photo below shows a large patch pocket with a smaller built in zip pocket. On the other side of the bag there’s a larger zip pocket and at either end I added elasticated pockets (divided in two). 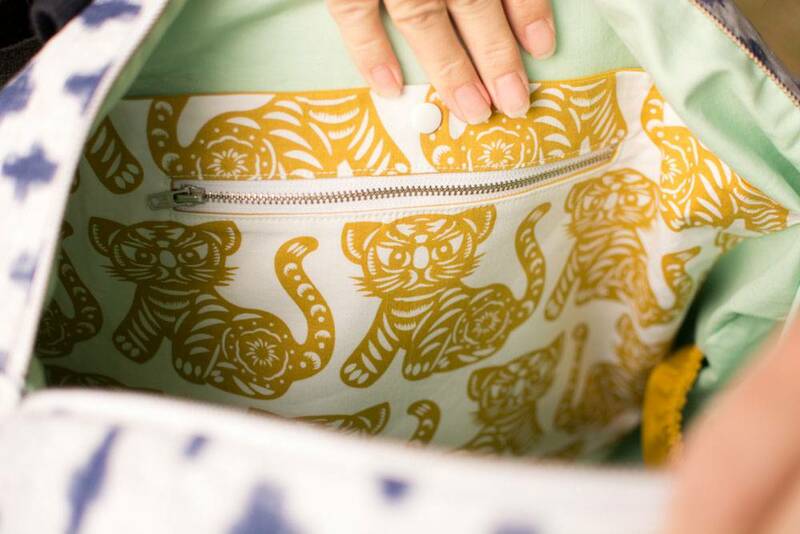 I have a tutorial coming up on how to draft your own zip pockets. The fabrics I chose to use were from the Indigo and the Seedling collections, both of which have some really interesting designs. I especially love those grumpy tigers! 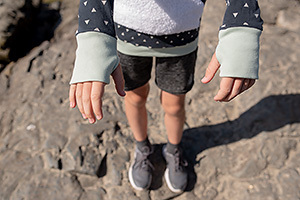 The great thing about Michael Miller fabrics is the amount of co-ordinates they have, which means you can normally find the perfect solid to match your print. I’d heard great things about Michael Miller’s cotton couture but hadn’t had a chance to try it until now. It is so much lighter and softer than a lot of quilting cottons and would be wonderful for garments. I was aware that this wasn’t really the recommended fabric for the Portside Duffle so I spent some time investigating interfacing. I chose to use Pellon SF101 for all the outer and lining pieces, then to give the bag some structure I added ByAnnie’s Soft and Stable Stabilizer to every outer piece (except the outer pockets). This is the first time I have used a Grainline pattern and I found it very clear straightforward to follow, except for the step where you create the shoulder strap. I figured it out eventually but next time I think I’d used a slider instead of two D-rings. I absolutely love the finished bag and really want to try and scale the pattern down to make a mini one for my boys to use. I couldn’t leave you without a full picture of me and my bump, which hasn’t made an appearance on the blog yet. I only have a month to go now so I better go and start packing that bag! Thanks so much to Michael Miller Fabrics and A Happy Stitch for asking me to be a part of The Great Pattern Hack. Here are details of all the others joining the blog hop. I’ve seen some amazing hacks so far. 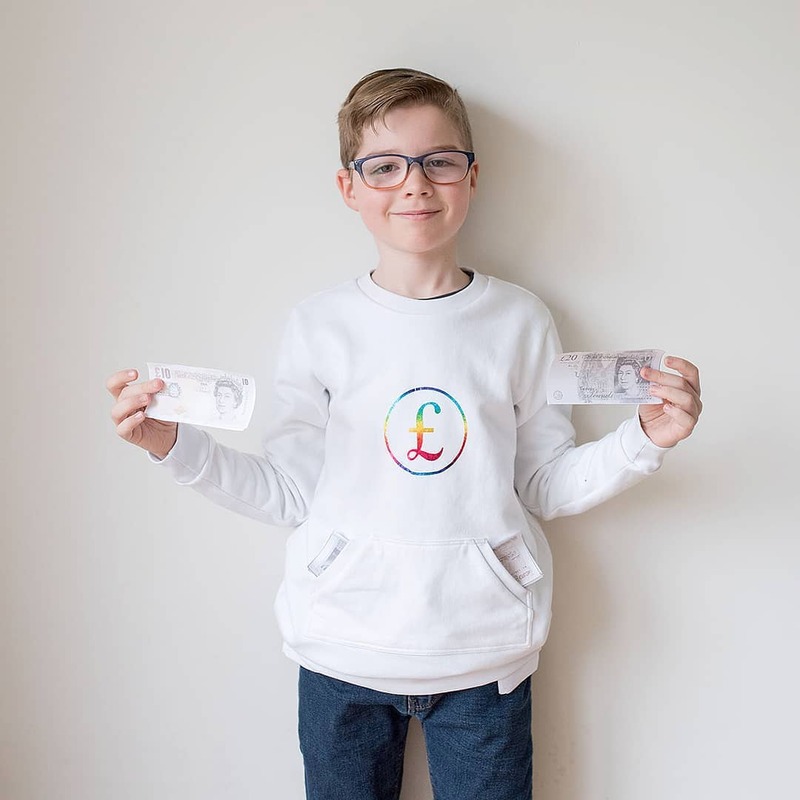 There will be lots of fabric and pattern giveaways – if you want to get involved then read more in this post to find out how. Wednesday 7/1 :: Flash Giveaway Day! Friday 7/17 :: Wrap up and Surprise Giveaway!!! *I was given all patterns and fabric as a part of this blog event, but all opinions are 100% my own. Looks fantastic! Love the additional pockets on the inside! 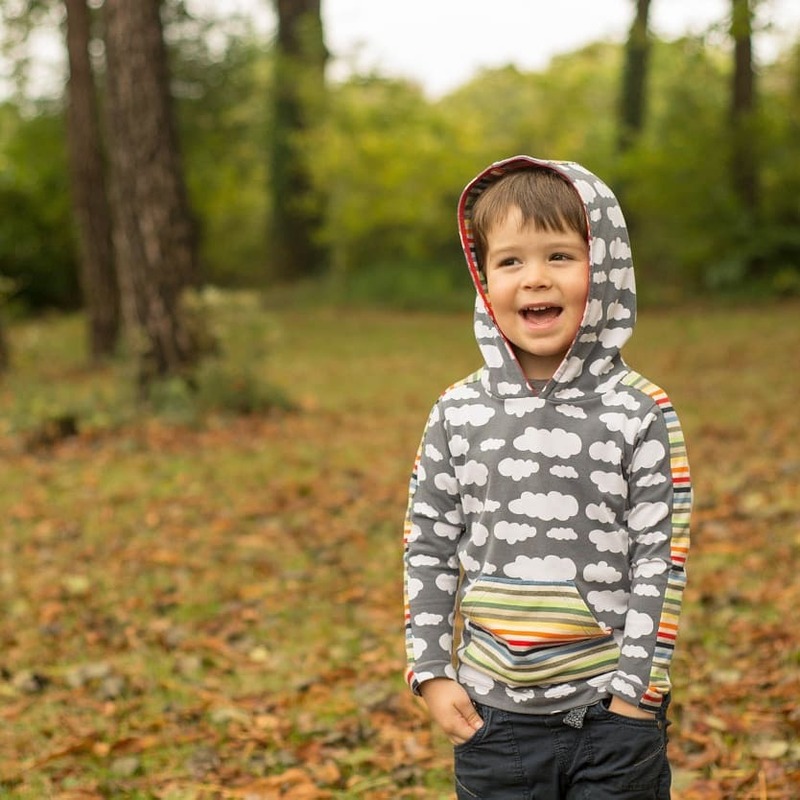 Thanks Kait, I really enjoyed being part of this blog hop! Thank you, I can’t wait either – hopefully not too much longer now. Love the bag! I am planning to make a portside duffel bag for both of my kids for some travel coming up this summer; great idea to add the extra pockets! Thanks Emily, I’d definitely recommend the pattern and the two pouch patterns that are included look great too. Enjoy your travels! Gorgeous bag and mama! I love the tiger fabric on the inside. I am sure you will get plenty of use out of this bag! Thank you 🙂 I think those tigers are my favourite bit. Thanks Abby, I hope the pockets will make finding things a lot easier. It was good to get some evidence of the bump too – not a lot of photos being taken around here at the moment!